December 19 afternoon, sunny winter day. College Administration Building, third floor conference room beaming widely believed the company was founded Ceremony Long Branch campus training base true account of the opening ceremony is being held, this opening ceremony was chaired by the Director of the school-enterprise cooperation at Ho Kwon Ping, executive dean Apostle together Vice President Du Baoshan, Dean School of Accounting Gao Xiaohong, Deputy Director of Academic Affairs Wang Haihui, Accounting Department Xu Yaming, secretary of the Department of Accounting Yang Jun, financial management department secretary Xu Jing, deputy director of the Department of Accounting Kang Jie, Li Xiaomei, deputy secretary of the Department of Accounting attended the meeting, chairman of Guangdong International Trust and corporate companies Fan Minyi ten instructors came to the scene, and the scene nearly a hundred students and teachers together to witness this important moment. First, the executive president of American Standard published a speech together, and this lead enterprises into the school to make sure that emphasized the importance of enhancing the professionalism of students, students of professional competence and hope for the community through the college -enterprise cooperation to cultivate more outstanding accounting class talent. After that, the chairman of Guangdong International Trust Company Fanmin Yi published a speech on school-enterprise cooperation prospects were good prospects. 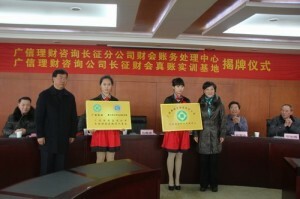 Kang Jie, deputy director of the Accounting Department of the Guangdong International Trust Company Long Branch campus true account of the training base is introduced. 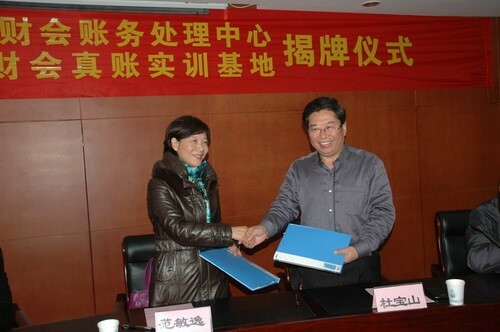 Vice president and chairman of Du Baoshan widely believed school-enterprise company Fanmin Yi represent two sides signed the cooperation agreement. After signing the agreement, the Executive Dean King James Hopewell co-chairman of Guangdong International Trust Company were inaugurated. After the opening ceremony, the leaders and guests visited the training center of Guangdong International Trust Company Long Branch, and the exchange of teachers and students with the field. Future cooperation will bring a lot of Guangdong International Trust Company bookkeeping services, accounting and send experienced professionals to guide students, future students out of school can not be true account of accounting and tax reporting.